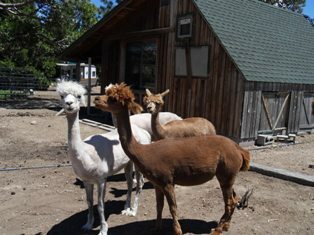 Shearing alpacas is a unique experience- the first time I saw the critter stretched out between posts I was a little horrified, being the animal softie I am. But, after seeing that they do not get hurt, and how much better they feel on a hot day with that huge blanket gone, it helped. 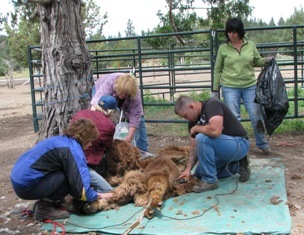 We now have 9 animals to shear, and we start the preparations about a month early. Sherri is a GREAT cook. She prepared a wonderful lunch for everyone to end the day. 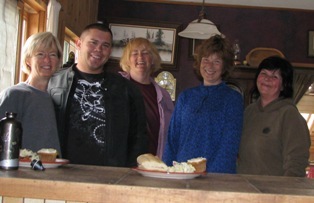 So, shearing day arrives, we have three volunteers to help- it is so cool to have people willing to help with this. 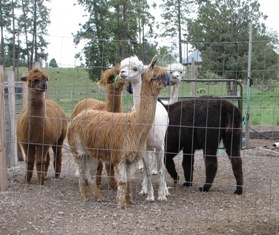 I even told them it was dirty,smelly and they might get spit on( the only time alpacas might spit) and they came anyway! The shearer rules. He is the expert and our guy Russ is great. 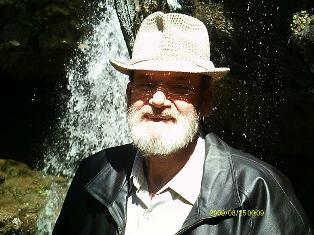 He is gentle with the animals, which is essential; and quick and efficient, and also patient with us! (very important). The day started with Pearly Mae eating the potatoe salad (refer to pigs in the fridge blog). Then we had to catch our babies- that is where I ended up on the ground, a bit of a dent in my finger, but none of the girls stepped on me, so all was well. Out girls really are sweet 98% of the time, until a couple of them that see that halter and are not pleased. Fortunatley they are not very big, and once you have an arm around their neck you have them, then once on the halter they calm down again. The girls get a little nervous. Our boys were easy! So haltered and ready to go. Russ arrives and so do Pam, Laura and Bear. READY! We start with the lightest color, Corrina and Bell, first. Then came our soon-to-be herdsire, Apache Gold. 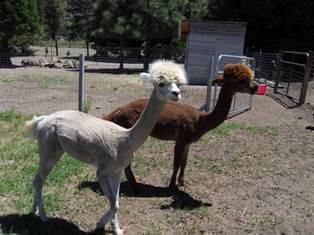 Jake, our other future herdsire is next, followed by Topaz, Carmelita, Cleo the Suri,and finally Lacey, who is overdue for a cria (baby alpaca). It is always a toss-up whether to shear a pregnant female, because these animals can be easily stressed, but since she was ready to deliver, we went ahead. Russ has a gentle way of shearing pregnant females, and she did well. Only a couple of little things along the way, the dogs went nuts- stupid of me not to lock them up before hand-so taking them into the house, my knee gave out-couldn’t walk, hopped in the house, threw on a bandage, and again, all was well. Sherri got whopped in the mouth with Topaz’s head- she had the botox lips for a day- without the expense! We have the shearer, a photographer, one person to hold the head, a person to gather the fiber from the shearer, a nail clipper, and a bagger. We swtich around but you get the idea. 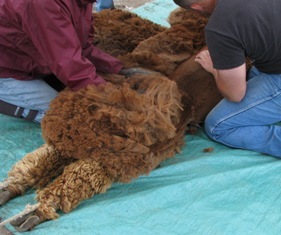 Bagging is a major part of shearing, one bag for the blanket, also called “firsts”. Then a separate bag of “seconds” which is neck, hip fiber- a bit less soft, but still used for gorgeous felt making materials and rovings. Then there are “thirds” which is really not used for anything except, we just found out, helping with oil spills! 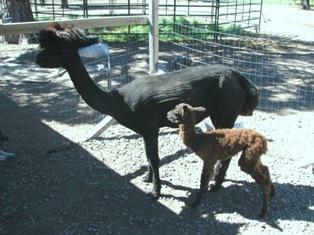 So everybody is now cooler, and 2 days later we have a new baby boy-Capuccino Jasper, more on that later. We had a great lunch minus potatoe salad, and we have some beatiful fiber and now for the processing. Thanks to all of our help- Bear the photographer is not in this picture, so I stuck one in.